It’s too hard and I feel even more lost than when I started! 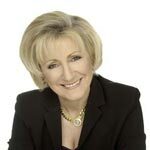 These were the phrases uttered to me in desperation from Helen, my coaching client. Things started off well. Her enthusiasm was there. I knew Helen wasn’t happy with her current financial situation and wanted to break free. She’d hired me to guide her through the process, to help her build a money-making blog business. As is often the case, Helen wanted to make money on her terms and not be a slave to the ‘dollar-per-hour’ earning model. She wanted to make money helping others, using the skills and knowledge she already had. Most of all she wanted a better way — a better business model that could support her lifestyle and create freedom, not trap her to a desk. I knew the potential was there for her to build a lifestyle business through blogging, if she could just tap into the audience that was perfect for her. The people who would love everything she did and pay her well for what she knew. I’m overwhelmed. There is too much to do, I don’t know where to start, and my progress seems incredibly slow. I’m going to have to go back to my job. Hearing Helen explain that she was not only considering giving up on her blog, but she felt that returning to a job she hated was her only option. I decided to once and for all solve this problem. I knew most people failed at making money with a blog because they gave up long before they had a chance to succeed. The problem as I saw it stemmed from a lack of clarity about her topic. Without clarity, every step feels random, and results are hard to come by. Without some kind of positive feedback, that early motivation quickly wanes, leading to more poor choices, more confusion and eventually the end game — giving up! What Do The Winners Have In Common? To make sure I was on the right track I decided to go back and do some very important research. 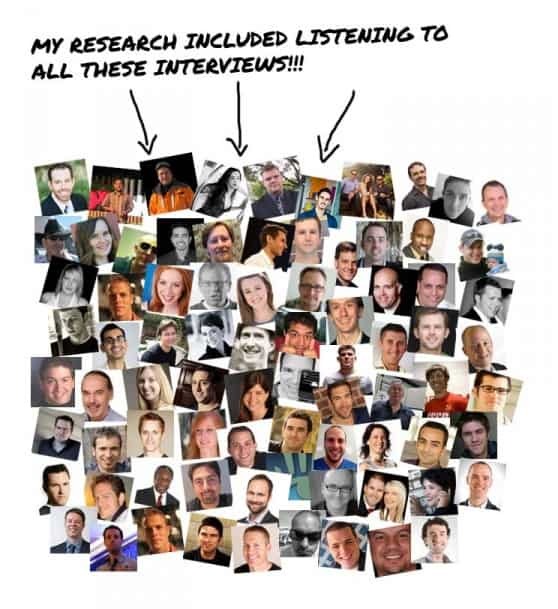 I wanted to review every big blog success story I helped create. After more than eight years as a blog coach, I have a large pool of success stories to draw on. I could review all of my previous blogging clients and see what they did right. Having helped dozens of bloggers create online businesses that make at least $100,000 a year all the way up to millions of dollars, and also running my own million dollar blog, meant I had all the data I needed. I dove in head first, re-listening to all the interviews I had ever done with successful bloggers. I looked for commonalities, and also the key differentiators that led to success. I also referred back to all the other case studies I had conducted with online entrepreneurs (over 150 in total! 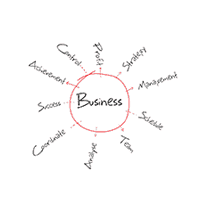 ), taking my research beyond just bloggers to see what exactly makes an online business work. Having had two other successful online businesses before I started blogging (an online card game shop, and later an online editing service), I thought back to what made them work. Why did I succeed where so many other would-be entrepreneurs around me fail. I also thought back to my own failures, those early years where I personally experienced the same frustrations Helen was going through now. I spent a good number of my first entrepreneur years angry at my poor results. I felt I had potential, if I could just put the pieces of the puzzle together. It didn’t take long for me to spot the pattern. My research brought up some clear commonalities. What made it interesting was the diversity of people and subjects. I heard success stories from men and woman of all ages. Some had come from entrepreneurial families, while some had zero business experience before they started blogging. The subjects varied from treating acne, to tennis, BMX bikes, to curing ADHD, to business advice for women, online dating, book publishing, penny stock trading, eliminating debt, skiing, homeschooling children — these subjects were VERY diverse! However despite all these differences, the reason these people succeeded when they first started online was clear. The rules, as far as I could tell, were universal. I told her that I could hand over the secret — the one big revelation that came from my research — and if she focused on it, all her current problems would be solved. I also said this secret is so simple she probably would laugh at me. Needless to say, she was intrigued. However before I revealed to her the path forward, I had to prepare her. I needed to be certain she understood what was at the heart of all her frustration and failure so far. You have to be careful when you first start a new blog business. The big mistake stems from human nature. We are actually wired to think in a way that leads to failure. To do otherwise is counterintuitive. The problem? We focus on ourselves. Everything comes from our own perspective. WE want to make money. WE want to help people with what WE know. WE believe they will really love what WE have to say. It’s not that you have poor intentions — you genuinely do want to help people — but the lens you view the world through is so inwardly focused you can’t see the mistake. This reason we think like this comes down to human evolution. We needed to be self-centered for our own survival and continuation of our genes. Unfortunately, when it comes to starting a blog business, this internal viewpoint blindsides us. To make matters even worse, often one of the first pieces of advice you will receive about starting a blog, is to think about your passions — to turn what you love into a money-making business. Once again the perceived answer is INSIDE YOU, when in truth, IT’S NOT. Passion is the wrong answer to where the money is. I’m going to give you the right answer in a moment, but there’s something I need you to understand first. In everything I had ever done that was successful, I could step into the shoes of my target audience, and truly understand where they were coming from. The projects I started that failed were ideas with potential, things I got excited about, but quickly gave up on because I had no idea where the money was to be made in that market. My blog business took things to a whole new level. My business was not about me, it was about my customer and audience. Yes I could use my stories, share my experiences and teach, but these had to be born from a knowledge of what my audience wanted, and a desire to serve them. This is the lesson I applied with my blog. This is why my blogging business surpassed all my other businesses. This is how I became a millionaire blogger. You’re most likely feeling the same way if you’re passionate about your topic and building a business around it. However there is a difference between being passionate yourself and understanding your customer enough to actually know where the money is to be made. Unfortunately, most people lack the necessary clarity (there is that word again!) about their target customer, which leads to big mistakes. It’s devilishly difficult to specialize and understand how to REALLY serve your audience because right now you don’t actually know them well enough (even if you think you do!). And many, MANY more. I’ve seen it ALL. After nearly twenty years as an online entrepreneur, ten years as a blogger, and helping thousands of bloggers to make money in their market, I’ve cracked the code. The answer to finally find the money in your market is a concept I call True Empathy. True Empathy means you know where the money is in your market. You know this because you have a genuine understanding — a true empathy — with the people in that market. It helps you zero in on the psychological makeup of your market, find the specialization that works for YOU, and generates the data to give you the confidence to make smart decisions. Understand this: Right now you DO NOT have a deep enough level of True Empathy. If you did, you would be making money. The cornerstone of the True Empathy concept is about turning the lens around. No longer do you focus inward at your passions, at what you think you know about your market. Instead, you flip it around and analyze your audience on a level you have never done so before. You must get inside their head and learn what really matters to them. The core emotional drive that leads your target customer to make a purchase. The exact words and phrases that your audience uses to describe their problem (HINT: when your words match your audiences words, they treat you like a trusted friend who gets them – it builds genuine rapport). The slice of your market that is perfect for YOU. 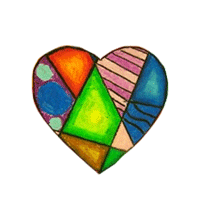 Find the subset within a market who are ideally suited to LOVE what you offer (thus buy everything you sell!). What currently sells. No guessing, this is where the money is because you can see empirical proof of cash leaving wallets. Your ideal offer. The exact first product or service you should sell so you can start making money now. How do I know this is the problem and that my solution works? Because not only have I gone through the process several times over my 10+ years of blogging at a high level to refine my own True Empathy, I’ve helped thousands of bloggers do so, in all kinds of niches. In every single circumstance, the breakthrough always comes from a deepening of True Empathy. Until this exists, it is impossible to succeed because you do not who you are selling to, why they buy, or what to sell to them (even if you think you do!). Just on my last group mastermind coaching call, I heard several permutations of this same exact problem from my current clients. Each of them solved the problem using the process I’m now making public. …And don’t think I’m the exception, either! My very own blog succeeded ONLY after ‘getting’ True Empathy. I spent more time on True Empathy than anything else. It’s responsible for taking my business over the million dollar level. It’s even responsible for this page you are reading now. I couldn’t write this if I didn’t have a deep understanding of where you are coming from. Take a close look at what motivated you when you just started out in your industry… AND… What people are actually motivated enough to purchase right now. What is the emotional motivation behind an action? What currently sells in your market now? These two questions will guide you down a rabbit hole, leading to some incredible insights, a narrowing of focus and ultimately that CLARITY you need so badly. In fact — stay with me here — completing this process myself made me realize that I needed to put together some kind of formal training around True Empathy. 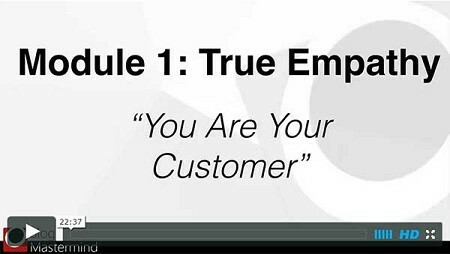 While doing True Empathy analysis, I discovered that this was in fact the biggest problem in my market. From my True Empathy, arose the realization that I had to teach True Empathy to others. This big ah-hah moment with True Empathy lead to the decision to create a new training program. Where is the money in your market? For me, the answer was simple. I had a three-step process to figure this out. Just three steps and you would never have to guess whether you can make money online. I call this process, The Blog Money Finder. 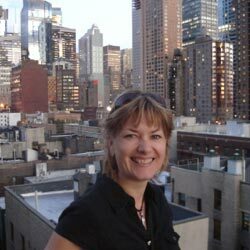 To start, I taught the Blog Money Finder system to my existing blogging clients. I made it mandatory training. You can’t take the rest of my flagship blogging course Blog Mastermind until you complete this research process. You have to know where the money is before you build a business. The results have been impressive. I’ve never seen people gain so much clarity. It’s like they have finally seen the light! For some of my blogging members, going through the Blog Money Finder helped narrow in on the true money in their market. For others they discovered they were going after a market with no money (no wonder they were so frustrated!) and with just a slight adjustment — a pivot — they found a source of hungry buyers they could serve. Often it is the subtle awareness change that makes a difference. The realization that how you talk to your market, what words you write and the swap in focus from looking inside yourself, to looking at your audience and what they want, that makes the difference. Now I want to share this system with you. 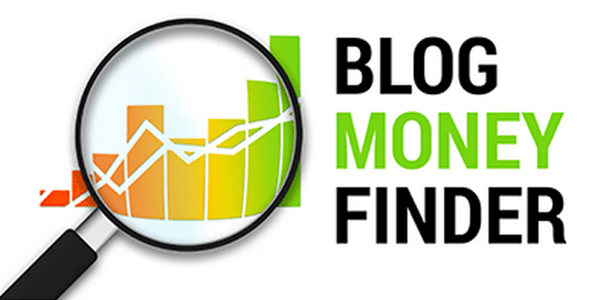 For the first time, The Blog Money Finder is available to the public. Would You Like To Use The Same Exact Tool Used To Repeatedly Pinpoint The Money Angle For Countless Blog Based Entrepreneurs? If you just mouthed ‘yes’ to yourself, you’re definitely in the right place. 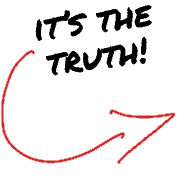 Finally leverage ALL of the knowledge, tactics and technology you may have amassed for your online business… which in all honesty was useless until NOW! 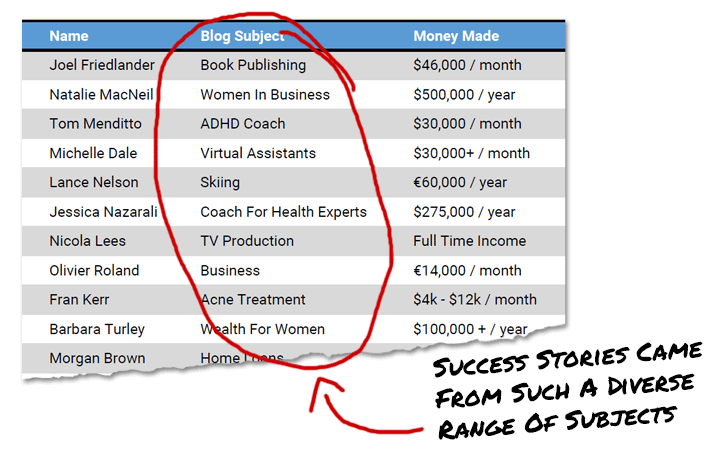 …and much MUCH more you’ll only see once you enter the Blog Money Finder insider process. As I created this course for you, I went to great lengths to make sure it’s extremely easy to follow, easy to digest and easy to implement. We’ve all seen enough courses thrown together that only give you a headache as you try to find any morsels of useful information in there, which seem like a bunch of random blog posts and other content hastily combined into a ‘course’. The Blog Money Finder is the polar opposite of that. 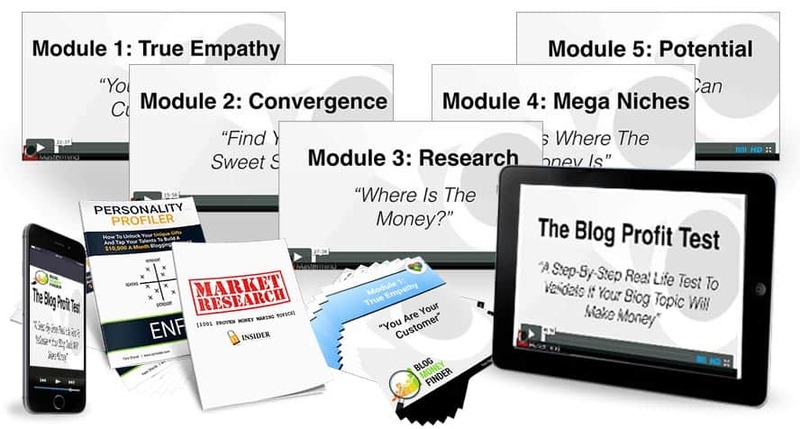 The core of the training is broken down into five video modules, all brand new. You can zoom through these all at once, or take one per day over a week — it’s up to you. Since I realize not everyone likes video, I made sure to produce every module as an audio MP3 for those who prefer to listen (I like to study audio at 2xSpeed for quicker absorption). I also paid top dollar for high quality transcripts with editing, so you can read though the Blog Money Finder in text PDFs if you prefer. All of these materials are digital, so you can take them with you on your smartphone, in the car, flying on a plane, when you are out for a jog or sitting at a cafe on your laptop. You can also print the PDFs if you like to read on paper. 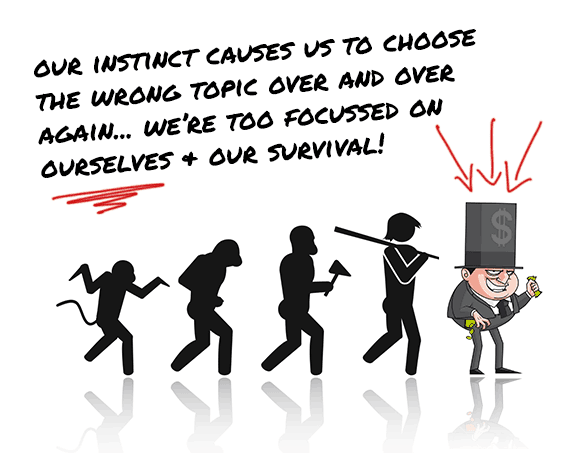 Discover The Shortcut To Your Market’s Subconscious And Use It To Relate, Engage And Profit! True empathy is a term I use to help you develop genuine empathy for the problems that your target audience is experiencing, or the need or the passion they have for a subject. In other words – walk a mile in their shoes, so you know how to write and sell to them. Everything depends on getting this right FIRST, so you’ll learn this first. 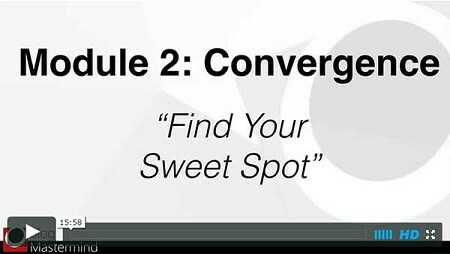 A Hidden Formula To Find Your Natural Talent, Credibility Or Advantage That Leads To A Sweet Spot Irresistible to Buyers! If you play tennis like I do, you know it’s all just waving hands around on a court while fuzzy yellow balls fly past you… IF you don’t know how to hit the exact Sweet Spot in your racket. …Which is a fair metaphor – it’s actually not unlike that in online business! Everyone has different strengths, backgrounds — stories to tell — that can be translated into an advantage. By that I mean a BUSINESS advantage. Inside module two, I’ll walk you through the process that just about FORCES you to see your ‘money topic’ – where your strengths and what people pay for, meet. 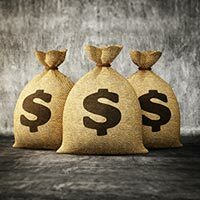 These Three Rarely-Practiced Layers Of Research Reveal Exactly Where The Money Lurks! Think of money as water – it’s always flowing somewhere. Just place yourself under the right current and place a bucket right under it. In the third module, you will get to see where it flows, and place your hand right underneath that stream. It really is that simple. There’s no reason to overly complicate it. It’s time to stop guessing, second-guessing and doubting yourself… all you need to do is ask the three key questions outlined, and a light bulb will go on inside your mind! This stage also involves a particular skill that made guys like Quentin Tarantino and M. Night Shyamalan rise to the top of their movie director careers: Observation! While screenwriters observe people coming and going in coffee shops, you will observe people in their designated hangouts online. I will list a total of twelve (12!) ways to do this, so no matter how obscure your niche, you WILL have your answers. After that you’ll be able to interact with your audiences (I’ll list 6 different ways) and make a quick ‘conversion test’ to verify that they’re true buyers. The ‘3 Layers Of Research’ I Advise All My Clients To Work Through — In The Correct Order — To Search, Discover And Refine A Money Making Blog Topic. How To Avoid Passive Markets And Find Active Buyers… Hidden Inside 4 Mega Niches! This module is all about showing you where the money REALLY is online. There’s no sense dabbling in tiny niches in hopes that you’ll be the exception to the rule and actually make some money. Instead, I will reveal to you three absolutely massive mega niches that ALWAYS exhibit outrageously active buyer behavior, whether we’re in a boom period or recession. Choose a sub niche from one of these and there may be no limit to your ability to attract people irrationally interested in what you have to say and sell inside that particular topic. Actually, there is even a fourth mega niche which is a kind of ‘vertical niche’. I’ll list proven markets and sub markets and their characteristics for you, leaving no stone unturned! 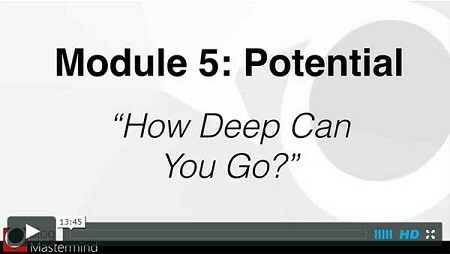 Finally, we dive DEEP into your topic and find out exactly how far it can take you. You’ll discover the different kinds of products you can create, what needs you can meet, how big can you really scale your topic. In short, just how deep the rabbit hole goes. I’ll walk you through eight different Product Platforms which you can then chain up into a funnel that guides your audience through big breakthroughs – and maximizes profit for you. By the end, you’ll be able to connect the dots and see the Big Picture that shows the way to Big Money specifically for YOUR business. I know what you might be thinking, all this sounds good — very promising — but you’ve been burned before. This might be the big breakthrough you’ve been looking for, but how can you be certain this is what you need? It’s easy for me to be confident. I knew this was the answer for my coaching client because I had the experience hearing the same frustrations repeated over many years from hundred of my blog students. I’m confident this is the answer to your situation too, but just in case, I’ve broken every key outcome this training delivers. Here’s The ‘Juice’ Inside Blog Money Finder: The Blog Profit Test Confirms Beyond Any Doubt That You Have – At Last – Found ‘It’! This is where rubber meets road, my friend. Your hard work WILL finally pay off. The Blog Profit Test is the final training in this program. It’s where you actually get to validate and prove your chosen blog topic will make you money (or not – which is just as important to find out!). After you’ve gone through the five-module video course itself, this final additional training will bring everything you have learned so far, and put it to the test. You’ll see me take you through a 7-step process that’s designed to get you some actual paying customers. It’s all very simple, easy to follow and fast to do: just round up the outcomes you got from Blog Money Finder, and come up with a working assumption to test. This is where the payoff really flies off the pages! Finally, you’ll have clarity about ‘what to do for money’. No small matter. Everything you do after this, will have a different ‘vibe’ to it. A ‘scent of money’ if you will. This Sounds Great, But It’s Not Just About The Money You Do Have To Enjoy Your Topic Right? Passion, as I stated earlier, is not where you can ‘find the money’, but it is a key ingredient to making money. You need to offer value to people, especially as a blogger. It’s much easier to make this work when you care about your topic. 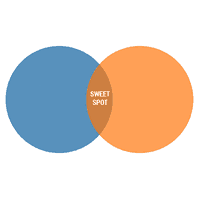 This is why I have an entire module in the Blog Money Finder about finding your sweet spot — that magical place where people spend money and you are perfectly built to deliver what they want. However for many people discovering your strength, your advantage, what makes you unique that can translate into a business is difficult. This is why I decided to add a very unique bonus to your Blog Money Finder package. For a lot of people these questions are equally difficult to answer. This is why I put together a very unique bonus for you. 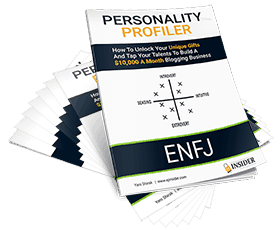 The ‘Personality Profiler’ bonus combines a test you complete to learn about your personality, and an interpretation guidebook that tells you exactly what strengths and weaknesses you possess as it relates to your online business. Certain people struggle with some things — like computer technology, or interacting with other people, or writing — while they excel in other areas — like following a system, tracking numbers, or coming up with new ideas. It’s absolutely vital you know what your strengths are, so you can tap into them, and what your weaknesses are, so you can avoid them and get other people to do these things for you. This test + guidebook will tell you things about yourself you’ve never known before. You might just unearth something that’s been holding you back your entire life, and now, with the awareness this special bonus brings, you won’t ever be held back again. 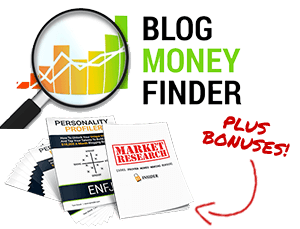 You will find the bonus Personality Profiler report and instructions to complete your personality profile immediately available in the members portal after you join the Blog Money Finder. 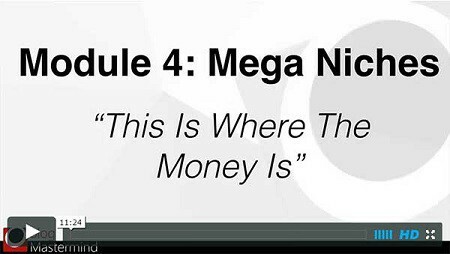 As you learn inside the Blog Money Finder: Module 4, there are certain proven money making topics that fall into what are called ‘Mega Niches’. If you’re still at the point where you have no idea what topic to go into, this bonus research report is going to be absolute GOLD for you. Here’s what I did: I asked my project manager to conduct a study with the aid of some online researchers to dig up best selling products. No guessing here. These are products that sell online already and we know are best sellers because they are in top ten lists, or have been selling online for years. 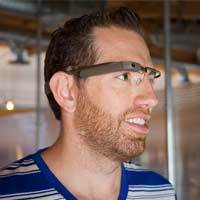 You can use this list of over 1,000 topics as a brainstorming tool for your own topic. It’s also incredibly helpful to see how granular subjects sell better. In this report you will see how two products might be in the same industry, but appear to very different sub-groups of people in the market. This is the kind of specific targeting you need in your topic — and this report is going to show you how it’s currently being done. You can download this 120-page niche research report immediately after you sign up for the Blog Money Finder. If you’re not sure exactly where you fit into a market, this list will help you see how it is possible to make money with very specific ‘niches within niches’, so there is definitely a place for you! As one of the longest serving blog coaches on the internet, I’ve enjoyed watching my clients succeed over many years, and then sending me kind feedback to explain how I helped them. …And appreciation to Yaro for helping Bloggers like me who have no marketing budget to join training or to purchase materials online to improve my Blog in every aspect. His teachings have slowly evolved and have inspired my team who have sincerely and deeply immersed into creating a successful Blog. 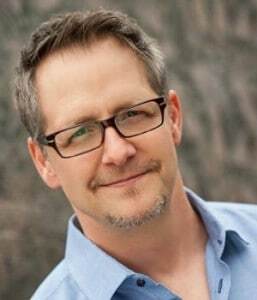 Thank you Yaro for your Blog which represents a holistic, integrated approach to personal and interpersonal effectiveness. 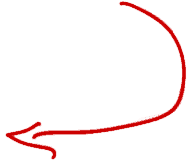 Now we have the opportunity to share our Blog deeply, meaningfully with higher number of readers. Do continue your good work! I am quite new to Blogging. Yaro’s advice helped me get started. After spending many hours searching for advice on Blogging it is his Blog that I came back to and make sure to check regularly. His advice is hands on and immediately useful. He speaks personally and practically, about what he has done and what he has learned from it. He is also blessedly free of hype. To help you get started and for advice on what works and what doesn’t in Blogging I recommend Yaro and his site unreservedly. I do not feel overwhelmed (which has been the biggest road block) because of the “step by step” format of everything. Busy with the Blog Money Finder now, doing my research and making sure I start everything off on the right foot. It really is an amazing program so far and I have a feeling that this might just change my life. I really like your balance of inspiration and realism. I feel inspired to act, while being realistic about what I need to do to make a blogging business – and I need to do this right now in my life. When it comes to teaching people how to make money online, there are a *LOT* of scam-artists on the Internet! I’ve been ripped off by heaps of them and I really feel the pain that others have gone through – just like me. But my life changed ever since I came upon Yaro’s Entreprenuers-Journey.com and it has became my daily hangout. I started out from a non-Blogger to a passionate Blogger because of what I’ve learnt from Yaro’s tips and advices he taught. They are simply INCREDIBLE! There’s NO HYPE, NO CRAP and they are really STRAIGHT TO THE POINT and HONEST. 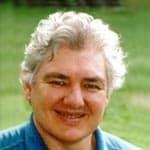 Most of my Blogging techniques were learnt just from reading his articles. Personally, I am very surprised that Yaro has shared so many of his profit-pulling ideas. If you are looking to increase your profits online or if you haven’t started out, listen to Yaro and I’m sure you will love his secret techniques. You took the obvious and pulled it together into a simple, easy to follow instruction set. Well, obvious may be the wrong word. We knew we should have been doing this stuff and just refused to. Now we can see that it really is the right stuff to be doing. Thanks Yaro for getting back on the smart track. Thank you for the opportunity to grab such a great resource. There is so much in there that I hadn’t thought about. I can now plan a whole strategy and know what I am doing. 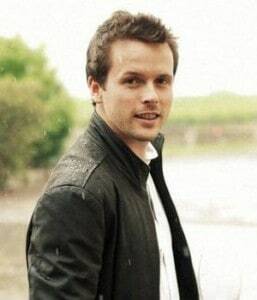 Yaro – Thanks! I’ve been struggling with then next step in the process and was told about your program. It really brought together and consolidated so many of the questions that I’ve had. I been receiving so many emails through my site and now requests to advertise. I’ve been stumped with how to handle everything – your program is just the ticket. One of the wonderful benefits you can enjoy once you build your online profile through a blog, is to get featured in mainstream media. As you no doubt realize, you don’t get invited to appear on live television, radio or featured in the big media publications unless you’re at the top of your field and have the credentials to back up your claims. Here’s a clip from my appearance on live television in Australia, as part of the SkyNews Business program, where I talked about how you can make money through a blog. 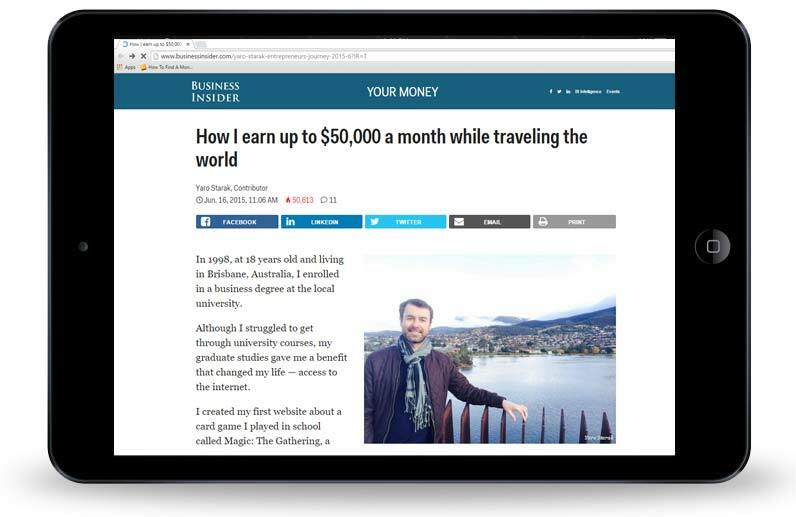 I’ve also been featured as an expert blogger in big publications like Forbes, Entrepreneur Magazine, The Age, as well as countless other top blogs and podcasts like Problogger, Smart Passive Income, Flying Solo, Entrepreneur On Fire, and Eventual Millionaire. 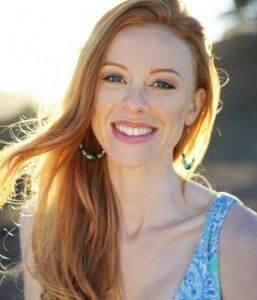 I’ve also been a featured speaker at events like The Hive, was a winner of the 30 under 30 Anthill Competition, and appeared in magazines like Virgin Australia (on all their planes) and Internet Marketing Magazine. Look. Of course you have the customary 30-day money back guarantee on my training. I have no interest in keeping your money if you don’t experience a true breakthrough. So go ahead, take your time, take the full training and if after going through the whole course and every exercise you still don’t know exactly where the money is for you… send me an email ([email protected]) and ask for your money back. If that happens I don’t want your money, so you can feel 100% safe here. However that’s not the outcome I want for you. I want you to complete the Blog Money Finder and feel you took a giant leap forward and finally understand why you haven’t made money in the past, and now where your ‘money-pot’ actually exists online. So, I’d like to above and beyond your standard money-back promise — I want to promise that you will find your money making topic. To make this a realty, I’m offering to get on a Skype call with you and privately coach you until you have the breakthrough and identify your money making market. Go through the Blog Money Finder, do the research and activities, and if you still don’t find your topic, let’s talk it out. Let’s discover it together. That’s my ‘No Blogger Left Behind’ policy. No Looking Back Now: Now That I’ve Removed ALL The Obstacles Will You ‘Keep Looking’ Or Start Making Serious Money? Enough words. It’s time for you to FLY! Up until this day, you probably had no ACTION PLAN for arriving at a place where you can make money. Now after reading this letter, you HAVE that plan. Find your strength… find the spenders… combine the two. BOOM! If you’re really hungry for change, you can go through this training in about two hours and be ready to take on the world TOMORROW. If you’re a trainer, a teacher, or a coach of any kind… this puts the air beneath your wings… And by ‘wings’, I mean money flowing to your account on a regular basis. One thing you may have concerns about is whether the Blog Money Finder is really the best product you can buy to find your money angle for an information product (teaching) business? You could be fooled into thinking there are other products out there that seem ‘bigger’. Take any comprehensive $2,000 dollar info product, and it will likely contain a tiny introductory section somewhere that supposedly covers ‘market research’ or ‘market selection’. However, those huge expensive products that take weeks to wade through, only very superficially gloss over this ALL-IMPORTANT topic of content monetization. Which is a HUGE MISTAKE if you intend to finally make any money! Blog Money Finder on the other hand, is designed for FAST consumption, FAST results and FAST implementation. If you’re even a little excited about this, you can be on your way to a repeatable-profits business model in a matter of HOURS. How Soon Will You Be Blogging… Knowing That Every Single Word Contributes To Your Income? You KNOW this is what you’ve always fantasized about: putting your knowledge to work for you, to help other people and make money doing it! I invite you to take Blog Money Finder out for a serious spin — find your blog money Sweet Spot, and quickly acid test it using the unique Blog Profit Test process. Honestly, it’s one of the best feelings in the world: knowing you’re actually helping people with your knowledge, tapping into an audience more than happy to pay for the privilege. Frankly, I can’t wait to hear about your results AND your profits! 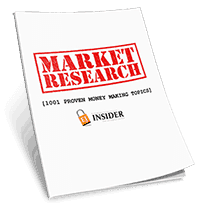 BONUS: The Money-Makers 1001 Niche Topics Research Report, a huge list of already proven money-making topics online. That in itself is more than enough to launch you from me-too blogger to having a healthy blog based business. Yaro Rocks! – What more can I say? 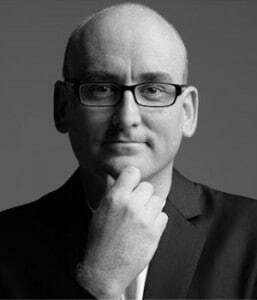 I’ve been watching Yaro’s Blogging profile and expertise grow over the last couple of years and have had the pleasure to meet and work with him on a number of occasions. 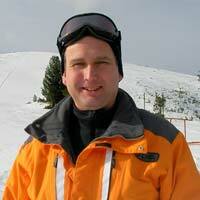 Yaro knows what he’s talking about and has built his Blog into an authority on the topics that he writes about. Bloggers can learn a lot from him! When I first collaborated with Yaro Starak, he struck me as someone who would make it. 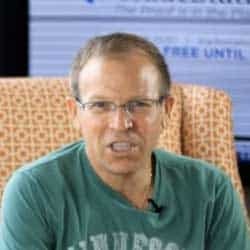 But at the time, Yaro was only making about $1,000 a month from his online marketing efforts after a year of hard work. He seemed resolved to take things to the next level, but I could tell he was a bit frustrated. What a difference a couple of years makes! Now, Yaro makes a good living from Blogging, working part-time. 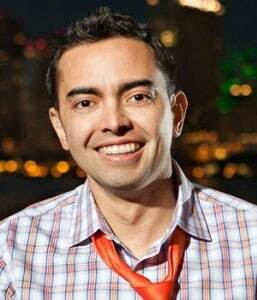 He’s not promising to make you a dot-com millionaire, but you can get out of your day job. That’s the first step. 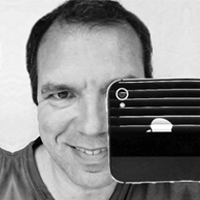 “Yaro is a true blogging genius! He’s absolutely brilliant at making money with the most minimal time investment possible. I’ve learned so much from him over the last couple of years and he’s played such a HUGE role in the success of my business. “While others work 60-70 hour weeks, Yaro has perfected an amazing work life balance enviable to even the most successful internet entrepreneurs. Even more importantly, Yaro has the ability to teach others to do the same. “If you are looking for an alternative to the traditional ‘career’ path then Yaro has the answers. 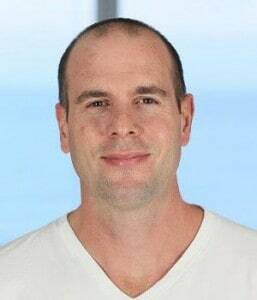 Yaro Starak is a supreme blogger, lifestyle engineer and full of integrity. Yaro’s insights were a key influence for my own journey from being stuck behind a desk in corporate hell to funding a rich and full lifestyle from the Internet. This training is for anyone who A) Does not have a money-making topic yet or, B) needs to refine their existing topic to figure out exactly where the money is. If you’re a beginner, you can do this, if you’re more advanced, this will open your eyes to what you are missing. You can find ideas similar to these, if you dig around long enough and then try and piece it together. Chances are though you’ve already tried to follow all that ‘good advice’ out there from people who’ve never actually made a penny from their own blog. You won’t find these specific techniques presented in this format, given in this strategic sequence with specific action steps for you to take. Plus I’ve made a million dollars blogging and I’ve helped other people start online businesses that have made millions of dollars. My track record is hard to beat! Once you click the buy button, proceed to the checkout and make payment, you will have a membership account created immediately and a welcome email sent to you. You can then login and download EVERYTHING, all five core modules of the Blog Money Finder, the Blog Profit Test training, and the two bonuses, with all video files, audio MP3s, text transcripts, task sheets and handouts available instantly — no waiting here! YES! Absolutely, this training will give you the insight you need to figure out how to better refine your existing topic to change direction towards the money. You will also figure out why you have NOT been making money up to this point. Knowing why things do not work is a big step towards figuring out what does work. Not at all. This formula focuses on researching human behaviour and learning about the emotions behind why people make decisions. Keyword research is mentioned in the training, but this is not a keyword course at all. The most important tool you will use is a computer, internet browser and access to the Web. 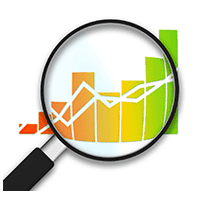 You need to be able to conduct research online by searching Google and other sites to discover where your audience are spending money. You do not need any special software to do this. Yaro teaches you in every lesson, so all the materials are from him. There is no one-on-one coaching, email coaching or phone coaching as part of this training, however you do have the option to bundle this course with one of Yaro’s direct coaching options when you go through the checkout process (look out for a free trial!). Yes you can. This program will teach you how to refine what audience you go after with your blog, however it’s not a “how-to” blogging course. 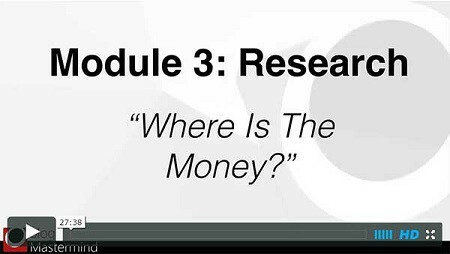 This is a “how-to” find where the money is online course. Yes you definitely can — I highly recommend it! If you want to learn why certain people make money online and so many people never do, this course will teach you. It doesn’t matter what type of business you run, if you don’t target a group of people online who actually spend money, it will not work. You can study this program in one day and begin conducting research that same afternoon. As soon as you understand what you are looking for you will experience a moment of clarity like never before — you will finally “get” where there is money to be made. Yaro’s program was the first I ever purchased online. I made the mindset shift to turn my blog into a scalable business, so I decided to go PRO. Yaro does such a good job at keeping you motivated with his program. He sets realistic expectations, it’s credible and it works. My blog started with no one reading it. I didn’t have a strategic approach to it. My success is because 1) I followed Yaro’s plan 2) I was consistent day in and day out and 3) I had a strategy. It took me two years before I hired a coach. Can you get there by yourself? Some people can, but a coach can get you there faster. Maybe don’t buy so many shoes or something else frivolous and put that money into education instead! “When I first came across Yaro’s website I had no clue what I was going to do. I kinda knew I wanted to run my own business one day, but I never considered being a blogger. I thought bloggers were time wasters! I didn’t understand the beauty of the front end blog and the back end business that can be born out of it. I started completely from scratch, I didn’t know anything, so I completely followed your process. I work better online, rather then having to turn up to a class in person, so it was perfect for me. It hasn’t been luck, it was by following the steps that Yaro provided for me (he’s not paying me to say that!). I’m so grateful to have actual people who read my stuff. If you’re sitting at home right now and all you have are just theories and ideas, you need to just go for it. Make a decision, create something, get it out there, get a buy button on it, experiment, never give up. It’s incredible how it can change your outlook, about how you can live and what ideas about money. 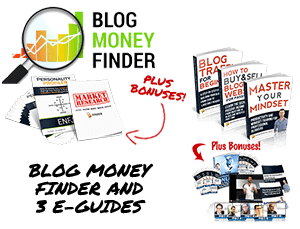 Get the Blog Money Finder today, and in just a few short hours you will know precisely what topic to write about, who your audience is, and what they’re willing to buy from you. This is a secret perhaps only 3 in 1000 bloggers know, if that! This instantly lifts You among the rarefied air of top bloggers who make a VERY comfortable living doing what they love. There’s nothing that gets you there faster. Not even my own high-priced coaching programs. That’s why I must insist all my clients start with the Blog Money Finder. P.S. Just in case it didn’t sink in yet, here’s the deal I don’t think you could possibly pass up: for the same amount of money you will spend on coffee this month (or chocolate if you are like me! 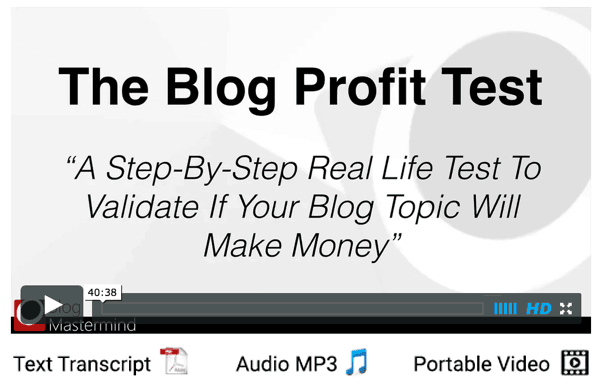 ), you get a proven process that shows you exactly how to make money through your blog… and then how to actually do it! I will raise the price eventually, but right now you get ‘early-bird’ access at this low, low price because the Blog Money Finder is brand new. I highly recommend you take me up on that offer. It may be gone the next time you refresh your browser. P.P.S. You know that feeling of frustration that comes from watching all these other people succeed online, while you sit there toiling away at your computer with no results. You are angry, or jealous, or just plain tired and would like to for once get your big breakthrough. What if I told you that your breakthrough is one day away if you take the Blog Money Finder and for the first time tap into a topic where people actually buy things. Don’t waste more time trying to pull money from a ‘dry well’ – go where the land is fertile already! It’s time you got your reward. Do this, and you’ll never look back! Take action today, it’s fully guaranteed so there’s no risk whatsoever. Yaro- I would like to purchase your course for $99, but as Iam out of work due to health problems I cannot buy it till the 8th Oct which is outside your time limit! Is it possible for you to let me in with this $99 on the 8th October 2015. I have to be firm with the deadline or it’s not fair for other people who sign up before the price rise. I wouldn’t want you spending money you don’t have either, especially if you have health issues to focus on first. Send me an email ([email protected]) and what we might able to do is offer you the discount as part of a bundle package later on when your health is back to where it should be and you’re in a better financial situation too. Wow Yaro, you creating a great tools again for people. I can sell your training right? Is it, the product i mean, already on affiliate page? I would like to start applying the lesson you gave in blog profit blueprint. People need to be passionate about something. Thank you for the great product and offer, I am definitely in! Just wanted to let you know, I’ve tried the Commonly Asked Questions, but no information appears when I click on them. Good to have you as always Mariana! Hmm, the FAQ boxes work for me in our browser tests and still does now. What browser are you using? I had the same problem. I’d click on the + sign and nothing would happen. I’m using Safari. I’ll get Carly my tech person to take a look and do some browser testing. Mine browser is Safari too. Sorry, there’s no ‘notify me for follow-ups’ here, so didn’t know you’re asking me something… Just a coincidence I came back to this sales pages to read again 🙂 (good example for me as always!). Might be a bug in Safari, who knows. I am not a tech person, but hope this helps. What I’m wondering is if this program provides any support from any coaches. I’m very interested in the program as I need some help with my blog. I’m in the difficult niche of teenagers and my issue right now is more traffic and how to reach them. Once we have the modules, are we able to ask questions? Will there be any webinars? What if I get stuck and need help – then what do I do? I’m not entirely sure if this program is for me, but I have to try something. Thanks. This is an introductory program, with an introductory price tag, so there won’t be any coaching time with me. If you want that then you are better to enroll in my flagship course Blog Mastermind, or join my community, the EJ Insider. Those two both include webinars with me. I joined last week but haven’t received anything yet. Is there a specific start date? Or should I have received links via email by now? You should get the welcome email straight away. You should also have been redirected to login straight away after completing payment. All the materials are ready for you in the members area immediately. The most common cause of a lost welcome email is it getting eaten up by your spam filter, so check your spam folder or any other folders that you might have set up and see if the welcome email is there. If you can’t locate it then send me an email ([email protected]) and my assistant will send you a second welcome email. Just bear in mind she is in Australia working Australian hours, so might be sleeping when you send the email. Thanks, Yaro! You were right–it was at the bottom of my spam folder. I’ve placed your email address on the “accept” list so there should be no more problems there. Hi Mr. Yaro, I should be grateful for this information that you have provided. after I read it, yes it is true that we need to build a good relationship with our readers, so we will understand what they want, we have to put our position as a reader to knows exactly what they want so that we can provide the information and sell anything they really want. From what I’ve seen, you can blog about pretty much anything and as long as you put a lot of effort into it and do it really well, it will pay off in the long run. Most people seem to think they can only make their sites about certain things if they want to make money, but I’ve seen sites about cats and pool cleaning that are making a killing now simply because they made their sites truly great. The pool cleaning guy’s site is probably the #1 authority in his niche, and anytime anyone has a question about how to clean their pool they probably end up on his site! Pick your passion and go all in, and don’t start feeling sad because it’s not paying off right away. It never does. I’ve just started my blog containing 3 posts in it for now. I’m doing Social Media Marketing and On & Off page SEO. I want your recommendation that whether these 2 things will be perfect for increasing rank and generating traffic. I could’ve used this about two years ago… I had an arts and crafts blog that was highly successful at the time, but I had no idea how to properly monetize it (besides selling ad space of course). I tossed around a few ideas but never came up with anything really solid, and now that site’s a far cry from what it was then. Know you audience is the most important thing and blogging iin a niche that can be monitized easily (aside ads) is the second most important thing. Mine is design blog and i am still unable to figure out how to get more people to read my blog. I have been promoting it a lot on social media but still it doesn’t seem to work. My average page views is 75 a day. Does this niche doesn’t have the potential i am looking for? It might be the topics or how you write the content Sumil. Are you writing what people want to learn about? I am really interested to join in this training. I recently read one of your post that blogging is changing.Is this training still applicable in 2016? I don’t know how old this training is. Do you update your video every year? I already know what I want to write but still couldn’t figure out how do I monetize it? For the last four years I’ve been focused on teaching the fundamentals through all my courses Jay, hence my training is very much evergreen. I know those phrases well “I just can’t make this work”, “It’s too hard and I feel even more lost than when I started!” I remember when I was saying it and now some of my teammates say the same. As you said many people quit before they even get a chance to succeed and it’s about every business area, not only blogging. Many people are focused too much on making a profit so even they want to help their audience as you said they don’t write their blogs with passion and at some point they get tired, overwhelmed and they stop the consistency which is very important. Yaro, this post is great and you share so much value in here. I will be coming for more. I just starred blogging in January and i think that choosing a good niche with high percentage of monitization is a good step forward. I could’ve used this about two years ago… I had an arts and crafts blog that was highly successful at the time, but I had no idea how to properly monetize it (besides selling ad space of course). Thanks..